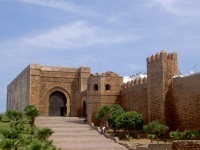 Rabat's Medina, or old city, was created by Andalucian Muslim refugees from Badajoz in Spain, and was essentially all there was to the city until the arrival of the French in 1912 and the subsequent building of the Ville Nouvelle or new quarter. The Medina is small and not as interesting or attractive as the old city sections of Fez or Marrakech, but the foundouks (traditional cafes) and shops make for a lively atmosphere. Souika Street is the main artery through the Medina, where you will find the leather sellers at the Sebbat souk (footwear bazaar). In Consules Street, shops sell curiosities, souvenirs, and Moroccan craft items such as copper and embroidery as well as the famed Rabat carpets. Another wonderful area to explore in Rabat is the Kasbah des Oudaias, with its famous white and blue buildings and lovely views. Rabat is blessed with some captivating ancient ruins which will delight history buffs: the Citadel of Chellah was once a Roman port city and the remains of this centre are interspersed with the tombs of an Almohad necropolis; another must-see is Volubilis, situated between Rabat and Fez, which was once a Roman city, and still holds some amazing ruins and mosaics. 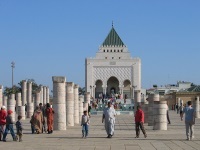 There are also numerous popular excursions from the city, including the seaside town of Temara, a convenient eight miles (13km) from Rabat, which is a favourite weekend picnic spot and campsite for city dwellers. 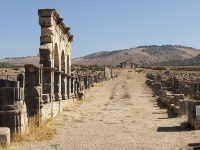 The town has several pleasant stretches of sand, and some good hotels, restaurants, and nightclubs. 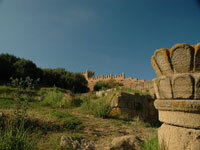 The ancient city of Meknes is also within reach.